Although your cat may act independent and be litter-trained, he still counts on you to provide him with food, water, safe shelter, regular health care, companionship, and more. Take care of these 9 essentials, and you'll be guaranteed to develop a rewarding relationship with your feline companion. Bring your cat to see us for regular checkups. 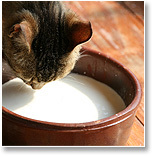 Give your cat a nutritionally balanced diet, including constant access to fresh water. Ask us for advice on what and how often to feed your pet. Be loyal to and patient with your cat. Make sure the expectations you have of your cat are reasonable and remember that the vast majority of behavior problems can be solved.